Endemic to Central Honshu, Japan in the Prefectures: Nagano (Akaishi Mountains) and Yamanashi (Yatsugatake Mountains). First discovered in the Yatsugatake Mountains in 1911 (Shirasawa & Koyama, 1913). In 1960 it was also discovered in the AkaishiMountains (Hayashi, 1960; Shimizu, 1992; Katsuki et al., 2004, 2008). It has an extent of occurrence (EOO) of less than 100km² (Kastsuki et al., 2010). It occurs in a single population distributed on Mts Akaishi (most sites) and on Mts Yatsugatake. On Mts Yatsugatake most mature trees are located in the subpopulations Fuki-sawa, Karamatsu-sawa and Senmai-iwa. It typically occurs in small, often isolated groups and there are estimated to be less than 1000 mature individuals in total (Katsuki et al., 2010). Typically the number of mature individuals in each stand ranges from nine to 135 and the area of each stand can be between 0.5–11.5ha with a mature tree density of about 10 individuals per ha (Katsuki et al., 2010). Some stands remain unknown due to their inaccessibility. Typically the subpopulations are often surrounded and isolated by plantations of Larix kaempferi which has contributed to low levels of gene flow (Katsuki et al., 2010). In the Yatsugatake Mountains it is restricted to lava flows, while in the Akaishi Mountains it is sometimes found on soils on phylitic rocks, sandstone or more commonly on limestone. It forms small groups of trees in association with Larix kaempferi, Thuja standishii, Picea. maximowiczii, Pinus koraiensis and Quercus mongolica var. grosseserrata. There is documentation of regeneration following coarse disturbance, for example the trees in the Yabu-sawa and Kaminigori-sawa sites in Todai-gawa location (Akaishi Mountains) regenerated after a rockslide about 100 years ago (Akashi, 2006). Regeneration can also follow fires and logging. 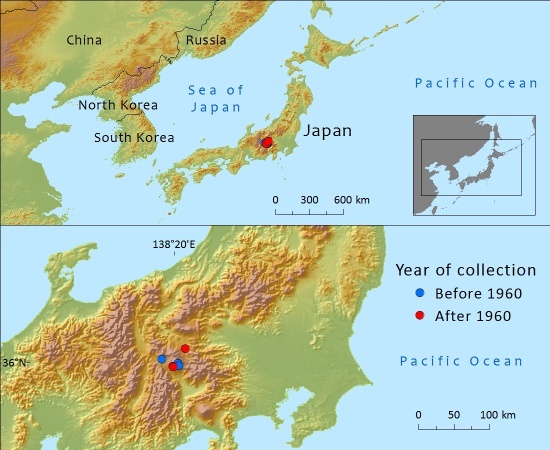 Using recently published distribution maps (Katsuki et al., 2010), the extent of occurrence (EOO) of Picea koyamae has been calculated as less than 100km². Historical events such as logging, fire, typhoons and landslides have led to relatively small, fragmented stands. Recent genetic studies indicate that there has been and is little genetic exchange between these populations (Katsuki et al., 2010) . Changes in precipitation, snowfall, temperature, and the frequency of severe weather events associated with climate change is also having an effect on the quality of habitat and regeneration. There has been a reduction of the area of occupancy and there continues to be a loss of mature individuals. This species is therefore listed as Critically Endangered. The biggest threat to Picea koyamae over the last 100 years has been from logging and replanting with Larix kaempferi: this has led to fragmentation with its associated consequences. Loss of forest as a result of typhoons is also a contributing factor together with forest fires. Today the most serious problem is the decline in the number of mature individuals and the deterioration of the habitat which is having a serious impact on seedling establishment (Katsuki et al., 2010). Picea koyamae is a relictual species that is at the southern extremity of the range for the genus; as a result it has become vulnerable to climate change and is unable to adapt to environmental changes (Katsuki et al., 2008, 2010). 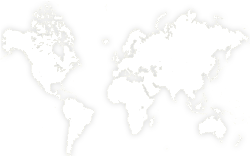 In some locations (e.g. Tennyo-san) there is an absence of seedlings which is thought to be due to the effect of Sasa bamboo covering the forest floor and damage to seed by a chalcid wasp. In 1990, only one location was given protection but as a result of further research into the distribution of the species, six more areas have been designated as conservation areas. Further research is needed into the mode of natural regeneration. Akashi, K. (2006). Microtopography, debris flow deposits and forest vegetation on the floodplains in the upper stream of the Todai River, northwestern Akaishi Mountains. Natural History Report Inadani 7: 33–78. Hayashi,Y. (1960). Notes on Japanese trees and shrubs. Bulletin of the Government Forest Experiment Station 125: 71–74. Katsuki, K. & Seido, K. (1999). Populations of P. koyamae and P. maximowiczii in Hakushu-sho, Yamanashi Prefecture. Transaction of the Kanto Japanese Forestry Society 50: 69–70. Katsuki, T., Aizawa, M., Akashi, K., Shimada, K. & Shimada, K. (2005). Present conditions of Picea koyamae and P. maximowiczii in Ohshika Village, Nagano Prefecture. Two threatened plant species at the southern limit of distribution (in Japanese). Natural History Report Inadani 6: 71-76. Katsuki, T., Akashi, K., Tanaka, S., Iwamoto, K. & Tanaka, N. (2008). An estimation of the present distribution of Picea koyamae and P. maximowiczii using climatic and geological factors. Japanese Journal of Forest Environment 50: 25-34. Katsuki, T., Shimada, K. & Yoshimaru, H. (2010). Process to extinction and genetic structure of a threatened Japanese conifer species, Picea koyamae. Journal of Forest Research: DOI: 10.1007/s10310-010-0227-4. Katsuki, T. & Gardner, M. (2011). Picea koyamae. In: IUCN 2012. IUCN Red List of Threatened Species. Version 2012.2. . Downloaded on 11 November 2012. Katsuki, T., Sugaya, T., Kitamura, K., Takeuchi, T., Katsuta, M. & Yoshimaru, H. (2004). Geographic Distribution and Genetic Variation of a Vulnerable Conifer Species, Picea koyamae (Pinaceae). 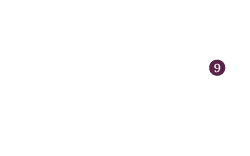 Acta Phytotaxonomica et Geobotanica. 55(1): 19-28. Note, H., Okitsu, S. & Momahara, A. (1999). Habitat of Picea koyamai Shirasawa and P. maximowiczii Regel ex mart. in Japan. Journal of Japanese Foresty Science 81: 236-244. Shimizu, T, (1992). Taxonomy and phytogeography of conifers, with special reference to some subalpine genera. 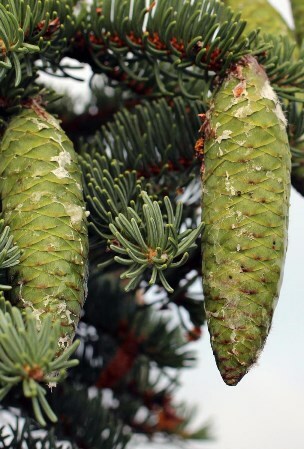 The genus Picea. Japanese Journal of Historical Botany 9: 3-11. Shirasawa, Y. & Koyama, M. (1913). 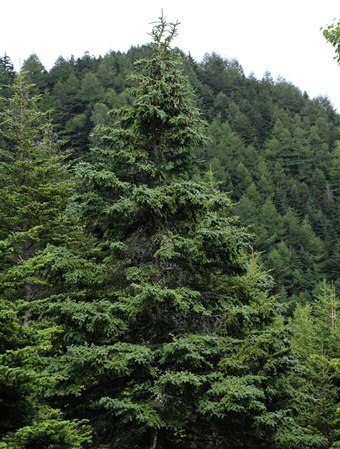 Some new species of Picea and Abies in Japan. The Botanical Magazine Tokyo 27: 127-131. T.Katsuki,and M.F.Gardner, 2014. Picea koyamae, from the website, Threatened Conifers of The World (http://threatenedconifers.rbge.org.uk/taxa/details/1033).